Musings of a Menopausal Melon - mmm! 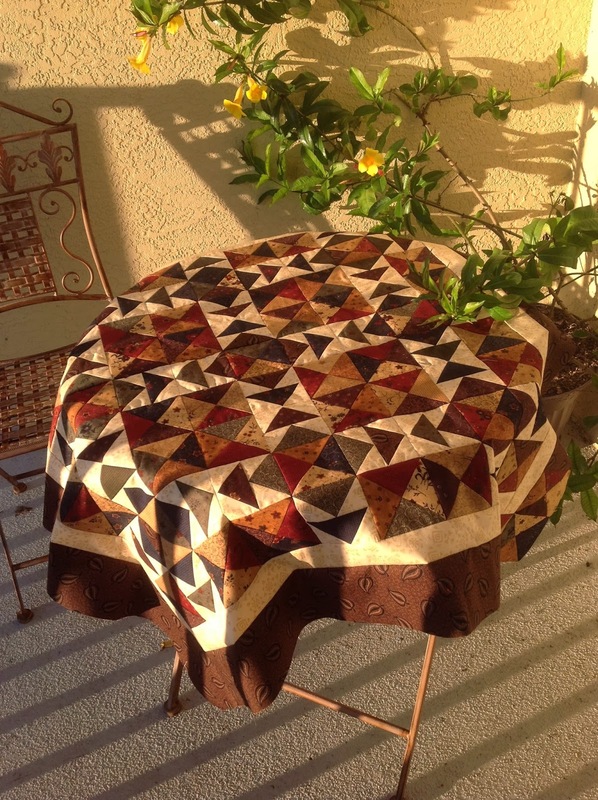 quilts: Charm Square Quilt - top finished! Had to get an outside shot to show off the warm colours. 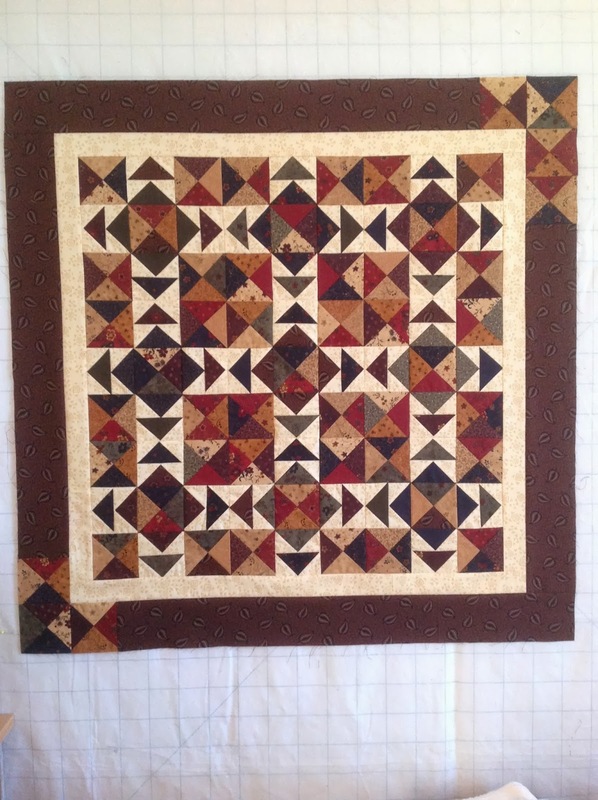 Here it is on the design wall so you can see the cool borders with added extra quarter-square-triangle units. Thought I'd show you a bit of the final construction process. This was my first layout. I let it sit overnight. In the morning, I changed up a few things. Look in the four corners for one. Another was that a couple of the quarter-square-triangle units looked more like half-square-triangle units (see rows 6 and 7 in the above picture) which I didn't like. I'd hoped that the beige and gold would contrast more than they did, and provide a bit of interest. 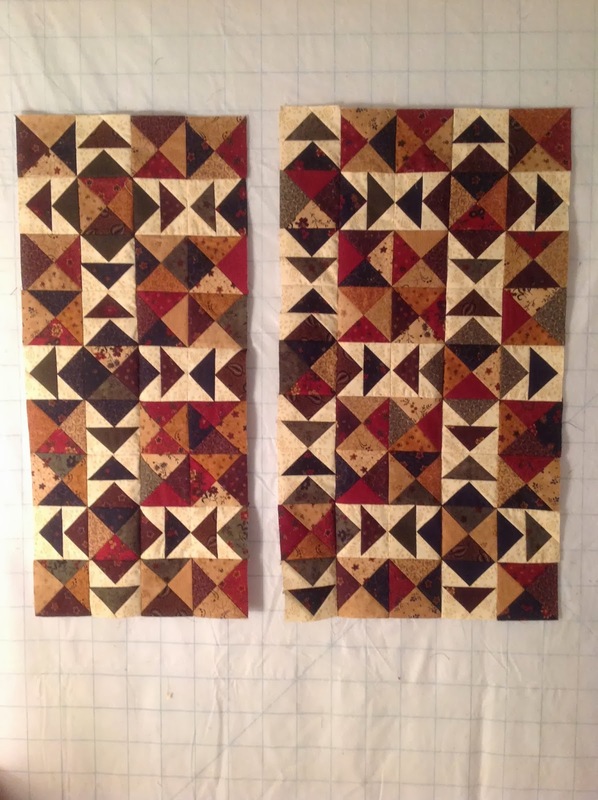 I found it annoying, so I "reverse-sewed" those two squares. I used my "Book It!" method of construction once I'd sewed the flying geese pairs together. 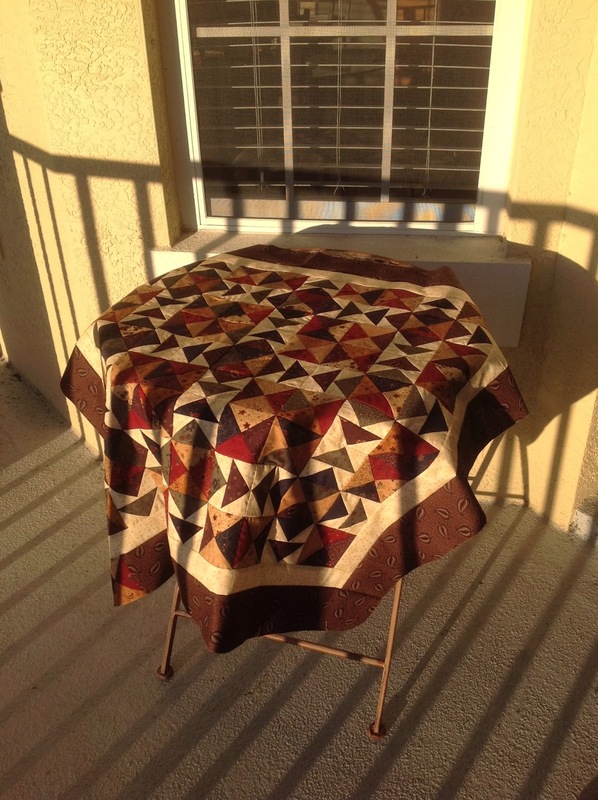 It really kept things nicely organized, as this quilt is symmetrical in all four directions. I left a 3" tail of thread at the top of each "booked" row, so I'd know which was the top of the quilt. Even so, there was a couple of times where I had to refer to one of my pictures to see whether it was a green or a blue flying geese unit at the top of a given row! 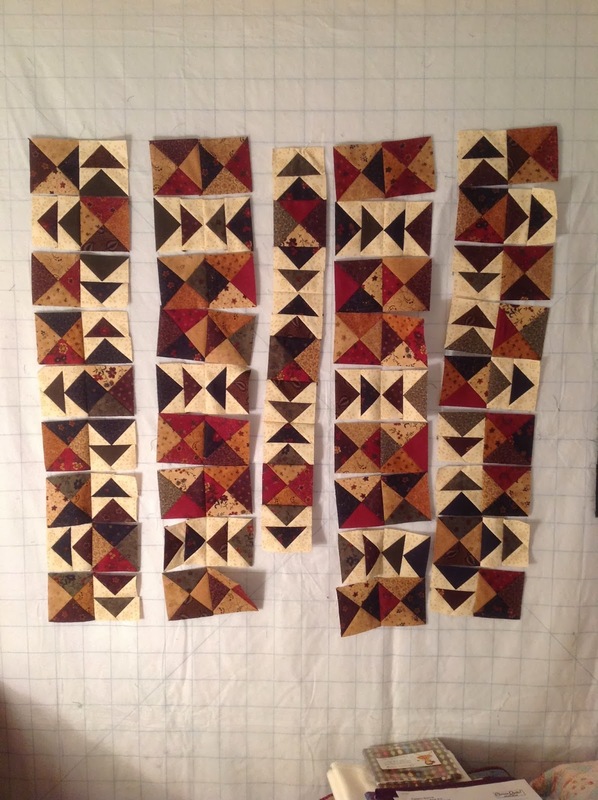 Notice how much the columns shrink as I pieced each pair together! 8 seams at 1/2" per seam (1/4" X2) means a 2" shrinkage per row. The two halves of the centre section ready to be joined. I was so happy with the paths of geese popping the way they do. I purchased this light fabric with help from one of the girls at Alma Sue's Quilts. I also bought the deep plum final border there. And here she is once more. It fits our bistro table rather nicely! 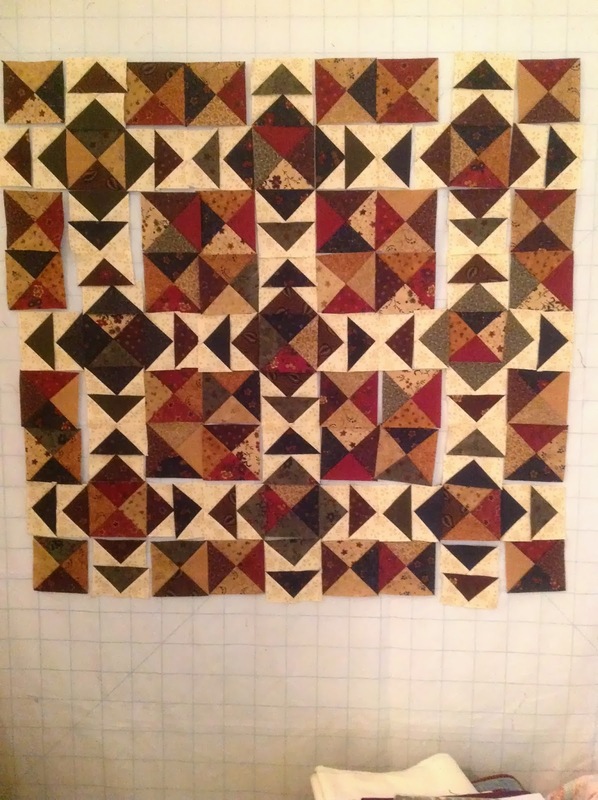 Now to purchase backing and get it quilted. 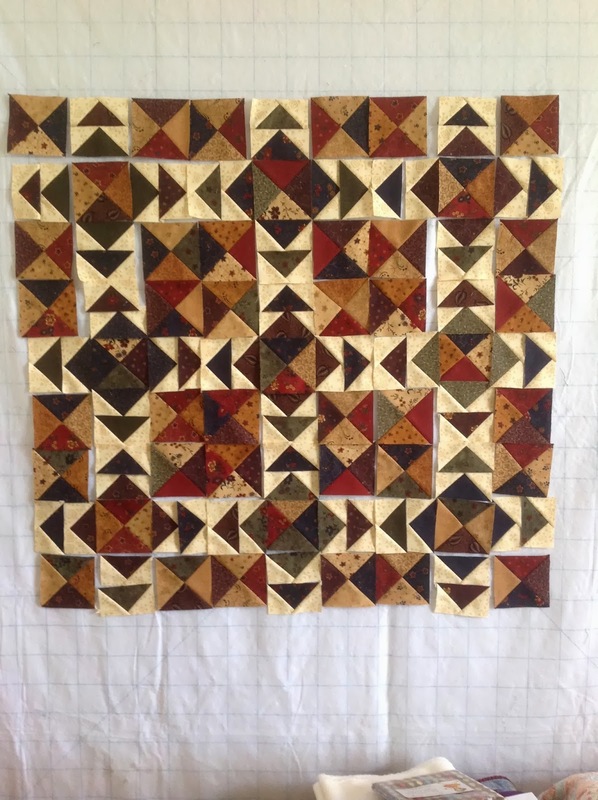 Pieces: 396 triangles plus 28 more in the outside border so 424 triangles make up this quilt! 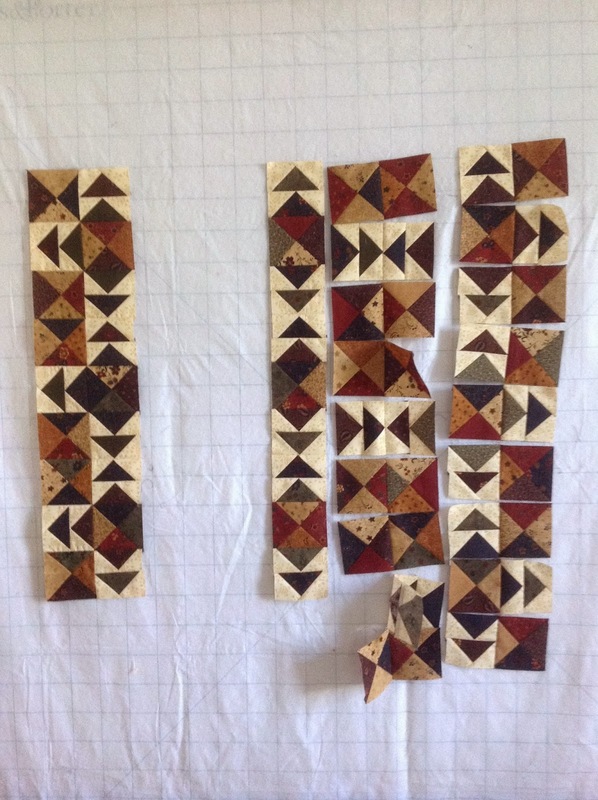 Thank goodness for strip-piecing and super-fast contruction methods! Oh absolutely beautiful! I love the colours! !